Since I love yellow, gold, peach and orange colors, I am always thrilled that my home takes on a soft yellow glow, however that is not at all what the real colors are. My walls, carpet and drapes are all shades of beige. Not an ounce of yellow anywhere. Here you can see a little bit of the wall color and how it is really just beige. 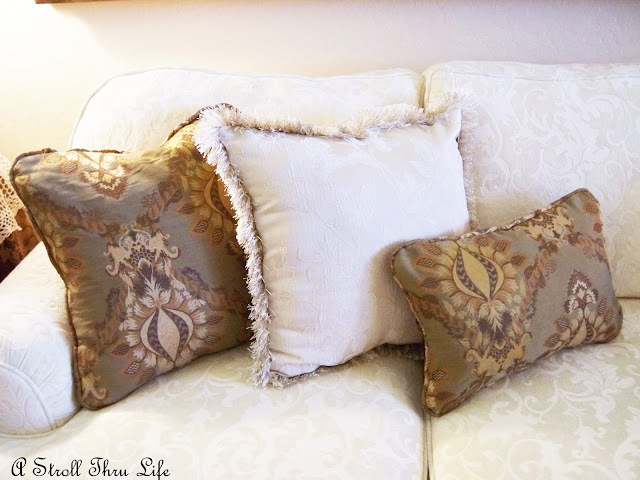 This pillow made from remnants of the drapery fabric also show how beige everything is. If I lay this fur throw on the floor, it is exactly the same color as the carpet. So, even though this looks sort of yellow again, I am really enjoying all of the beige and white. Such a soft color scheme and so fun for a change. I still havn't made my new pillows yet, but these are a couple that I have that match the tableskirt and my ottoman that I made when we first moved in. The cream pillows are actually ones that came with my bedroom duvet set, they had been packed away since I havn't ever used them. They work great here. The little crochet table topper adds a touch of elegance to the table. It's one I found at Big Lots for $4. How fun. 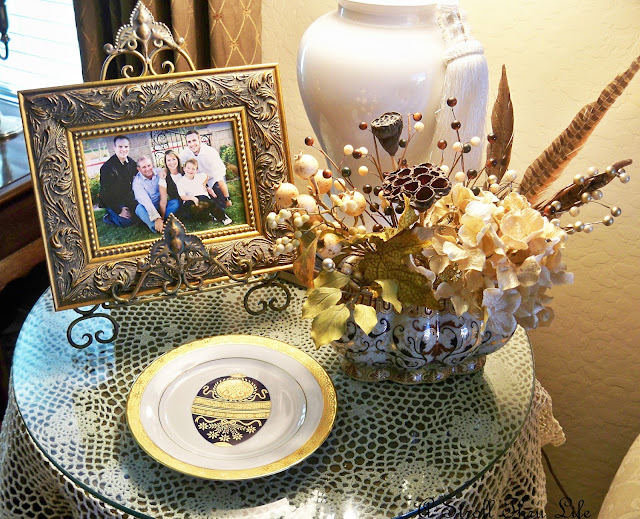 A picture, plate and the floral arrangement that I showed you finishes off the table. 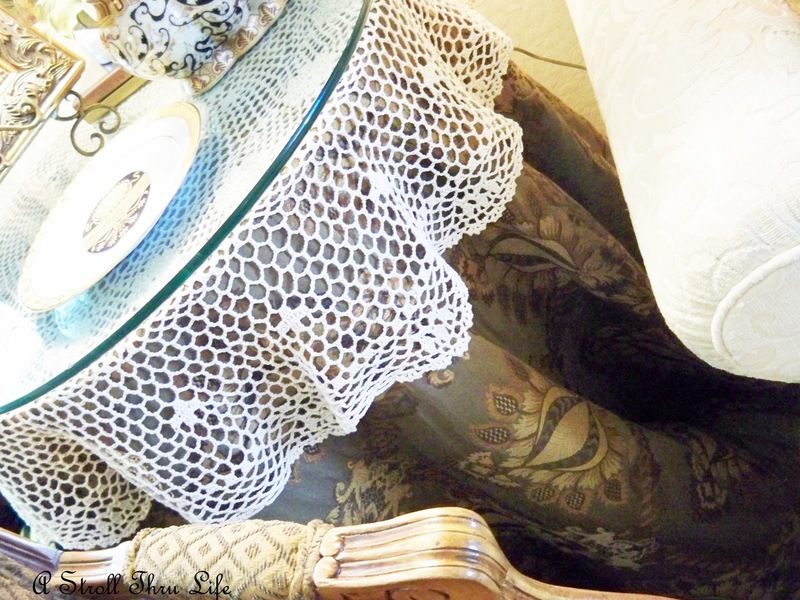 I really like this fabric with the pretty medallions on it. 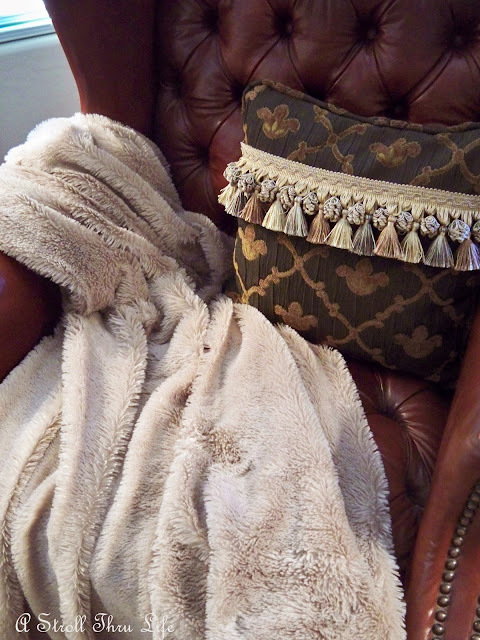 Seems to go with everything I have and the colors are perfect with my frenchy side chair. I really like the champagne bucket feather arrangement with the soft beige too. I see gold and silver all over in the magazines, so I am experimenting with mixing my metals. I still have the pleasure of my son and grandson visiting, so it will be a while before I can sew. However this gives me a taste of a beige and white color scheme. Great change. Kind of a non color, but oh so clam and soothing. 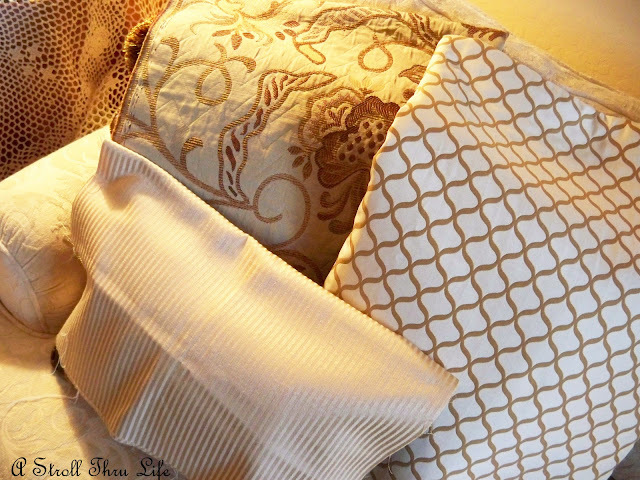 So when I get these new fabrics sewn and added to the mix, I think it will look super. It's all so lovely and elegant. Looks like it's right out of a glossy magazine! It is all looking very pretty, Marty. Can't go wrong with beige and white. I love your posts. 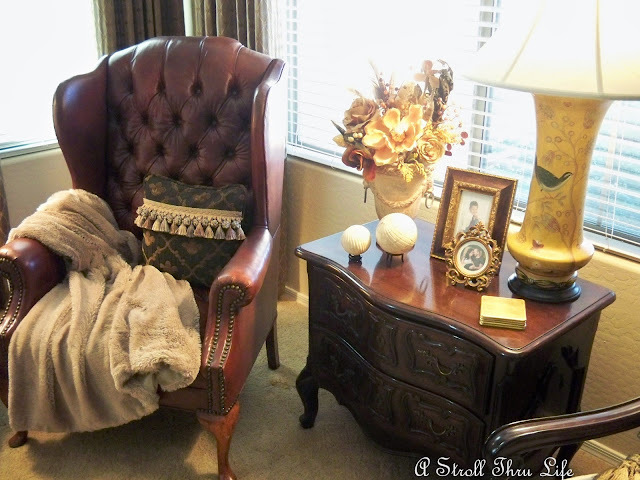 You have one of the most comfy looking homes that I have seen in Blogland. I am not a fan of the museum looking living rooms and this definitely isn't one of them. Yet it still looks designer done. Such an inspiration! 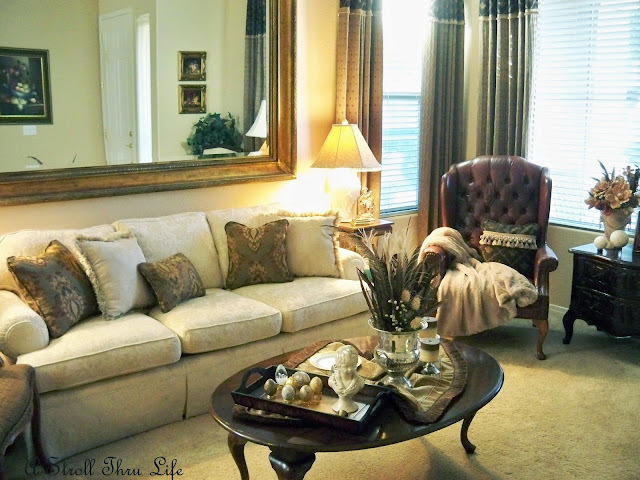 Your living room looks so pretty with the small changes that you have made. Always beautiful. Beige and white is Perfect.. it looks very elegant indeed. You are so right...the effect is soothing and calm! Love it! Hi Marty! Your home always looks so pretty and I do love all of the light you get. The way my house faces and with all of our trees in front, my rooms are kinda dark. I love the light! Always so pretty! Don't know how you always manage to change it up and make it look so great! It looks so pretty, Marty. Can't wait to see the new pillows but do love the ones you are showing. XO, Pinky PS, LOVE that feather arrangement!!!! Very warm and becoming colors. 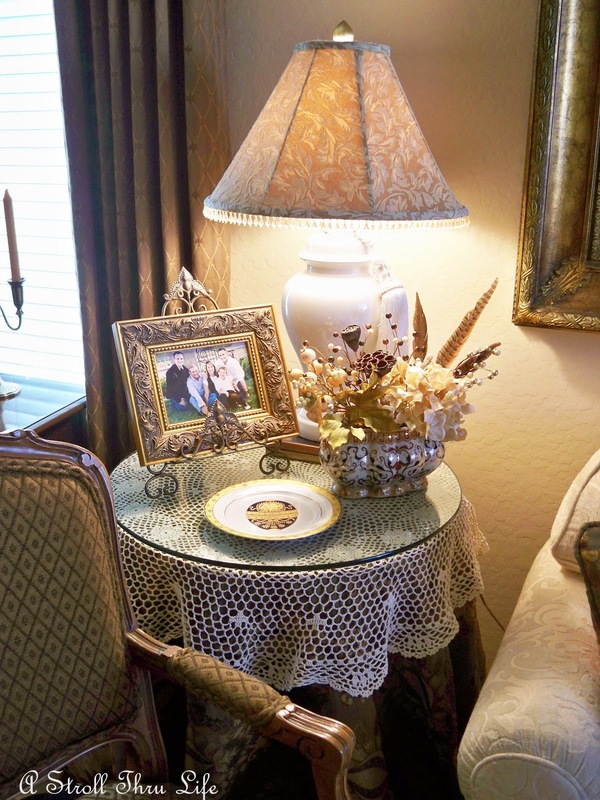 I like that doily on the table....you room is always lovely...no matter what the color! Your such a busy bee. All your projects are well done. Hope you and DH are in the best of everything. Cheers for a blessed year for both of us. Looking good Marty! Love the script chair. I am lost on the new blogger dashboard - do you like it? I'm a huge fan of the "white" family! ;). It's coming together great! It looks fantastic. So clean aand fresh. Happy weekend! It will look fantastic! :) I love all the fabric swatches. Your home always looks so elegant. I've really been enjoying the neutralness of our new place, Marty! So I know what you mean. I thought I might miss all the color I had in my previous home, but I was kind of feeling the need for a change even before we moved. I really love the cream with the beige and all the variations. Marty, the room looks so lovely and serene! The neutrals are so perfect, yet they really do glow in the sunlight! Your pillows look great! I love where you're going with your color scheme, Very pretty! Marty, your living room always looks so lovely and this is no exception! I'm really looking forward to seeing the addition of the new fabrics. I have been loving the neutral look of off whites. You can do so much with pops of color when you want to.I bet I know where you got that great fabric!! Wish I had had time to get over there while I was down there. I would love to shop there again!! Can't wait to see your new look Marty- I know it is going to be fabulous! I do love the calm of these colors. Very pretty and just what is needed after all the colors of Christmas. That throw looks cuddly soft. That is my chair when I come to visit! You know, I was redoing my dining room table yesterday, taking off the holiday centerpiece and changing the tablecloth, etc. The whole time I was thinking of you and all your wonderful arrangement. :) It made me smile. You make decorating a true art form. Looking great..looking forward to your living room transition!..Know it is going to be a great one! Wishing all the best to you in the new year!!! I have been thinking about going with a soft beige color scheme as well, my husband thinks it is too "bland as he calls it. I showed him your post of your beautiful living room and by gosh I think he has had a change of mind. Thanks Marty ! Marty, Your room looks so bright and pretty with the beige and white. I always look forward to seeing what changes you have made. I love your home Marty! 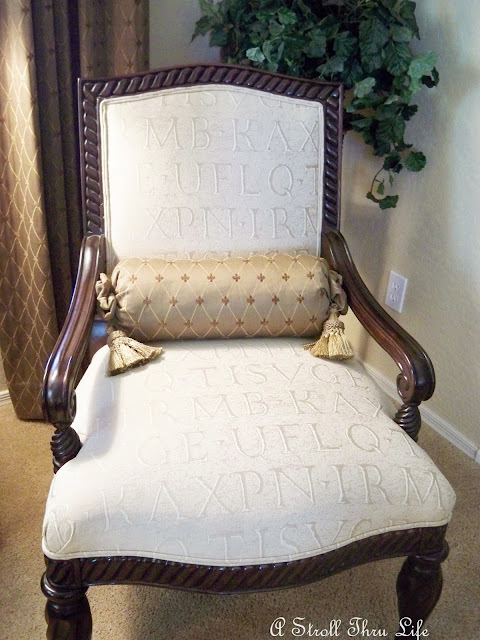 Also the chair that has the pillow on it that you made out of the drapery fabric! Just beautiful! So lovely Marty! I LOVE the champagne bucket vignette. I'm having fun mixing gold and silver too. I think it's such an elegant combination. You do a wonderful job of weaving magic on your home. I would sworn your living room was a soft shade of yellow! I love how you change it up and keep everything so fresh Marty! And that material is simply gorgeous! 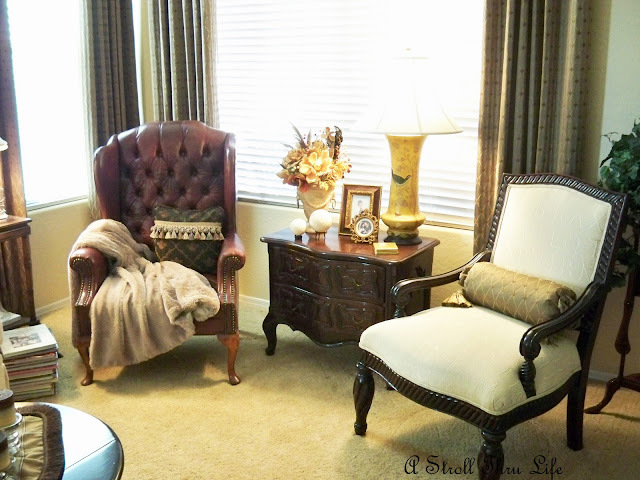 Marty, you have such a way of excuding warmth, class and style into your decorating! 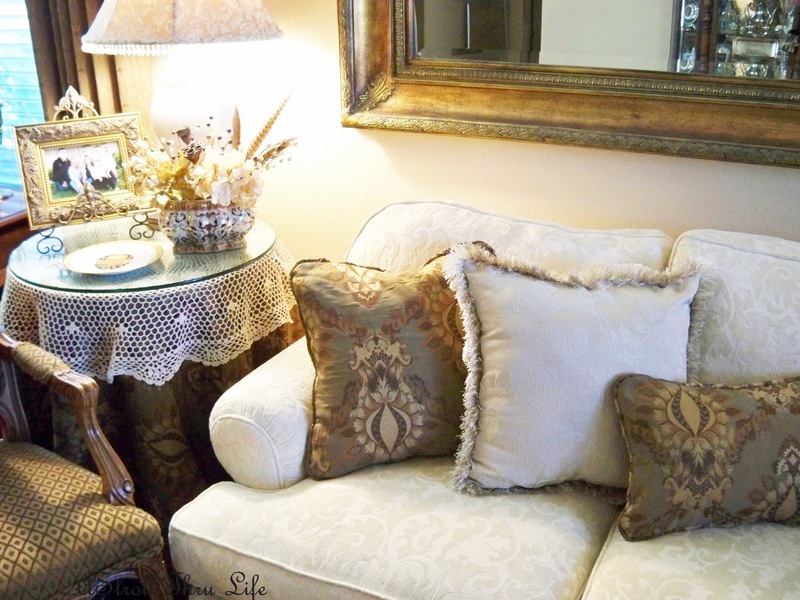 Your fabrics are all so lush and the accent pillows that you create are perfect! 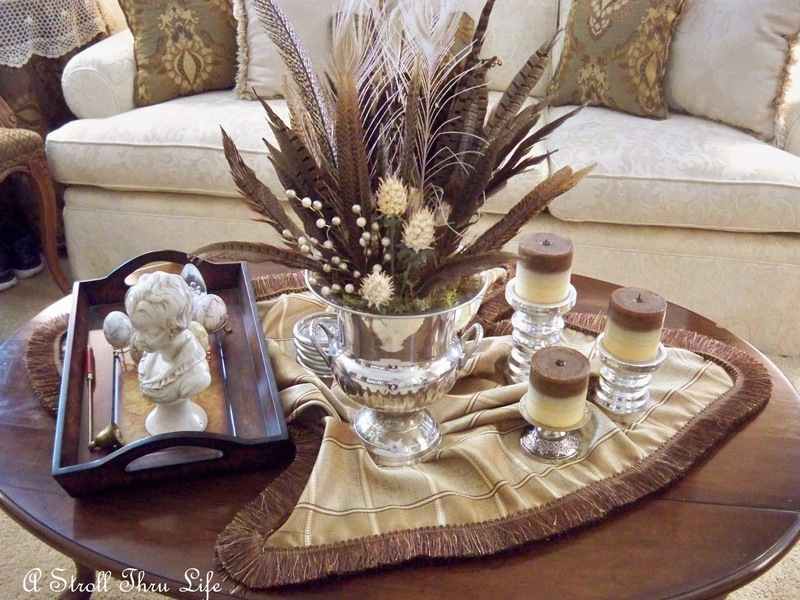 I love your neutral tones, but the way you seasonally add pops of color is fabulous! Your vignettes are, as always, fantastic! I would love to be a visitor in your elegant room, Marty. Thanks for your visit. Yes, both our boys are keepers but different in so many ways as siblings can be. You've made some great changes to your room, Marty! Everything looks beautiful! I love your handmade pillows. The fabric you chose is perfect! Whatever you do, Marty, your rooms always look picture-perfect! This is my first time visiting your blog and I am your newest follower! Your living room is elegant, beautiful and yes, so soothing. I love a good beige, tan, taupe room. Our living room is "Oregon Dunes" - an old Lowes color that we can't bear to change. It goes with anything and is always relaxing. Look forward to seeing more of your posts. Your taste is impeccable.